“Yes, it’s Terri with an ‘i’,” I replied. That’s the girl spelling. I changed the spelling of my name from Terry with a ‘y’ back in Grade 2, having discovered that I’d actually been spelling it the boys way for my entire life! But I guess everyone wasn’t privy to that rule. Or maybe the clerk behind the bakery counter didn’t realize that the cake I was buying was actually for me. To be honest, I wasn’t exactly upfront about that. That type of admission was sure to be accompanied by a host of unflattering social assumptions. And since this cake was for a big celebration, I didn’t want it soiled by awkwardness. That’s how much I love cake. And for a while, I bought myself congratulatory cakes whenever I felt I deserved one (and did I ever deserve this one)! That is, until I started making them myself. I’ve been making and decorating cakes for 15+ years and this Chocolate Italian (Genoise) Sponge Cake is one of my all-time favorites! The funny thing is, I always felt like a bit of a fraud changing the spelling of a name that wasn’t really wasn’t even mine to begin with. According to Mom, “Terry” was my nickname. Yet, it’s all my parents ever called me. Even though my legal name was Teresa, Mom said they never had any intention of calling me that. I once asked my Mom why she felt the need to complicate my life like that and she said, “Because I wanted you to have both a formal name and a nickname.” I thought that was really stupid. Yet, I went and did the exact same thing to my daughter. Funny how perspective changes. Given all that, the spelling of my name on this cake was pretty important because I was rewarding myself. I was celebrating my victory of having made it an entire 2 months without smoking a cigarette! Hell, there was a time when I didn’t think I could have made it a one day, much less 60! And I had read that rewarding yourself regularly was a good motivational tactic. And naturally, buying myself a celebration cake seemed like the perfect reward and motivator because well, like I said, I love cake! And cake is the ultimate symbol of celebration, is it not? Just try to think of an important celebration in life that doesn’t involve cake. And if you knew me as a pack a day smoker, that cared about cigarettes more than almost anything else in the world, you’d understand just what a momentous occasion this was for yours truly. Flash forward 20 years and 7 months~ I am still smoke free (yay me!) and I still love cake. Although, I don’t often buy cakes these days, I still love to make them. Yet I had never made a sponge cake, much less and Italian sponge cake until a couple of years ago. Now, I am obsessed. 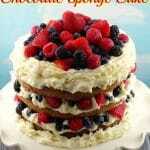 Sponge cakes are light and airy and are known for having a subtle flavor and delicate texture. Génoise sponge cake has Italian origins, although it’s been adopted for treats that are more commonly associated with French cuisine. The batter is also the basis for Madeleines and ladyfingers, delicate cookies baked in molds. Italian Sponge Cake often ends up in a layer cake, such as this one, with fillings like whipped cream, buttercream or mousse. And while the sponge and genoise are often regarded as being one and the same, they are, strictly speaking, two quite different creatures. A true sponge contains no fat other than that occurring naturally in egg yolks, and the yolks and whites are usually beaten separately. With a genoise, butter (in this case melted, but clarified butter is used in some) is used to enrich the batter, which is made by beating whole eggs, sometimes with additional yolks, together with sugar. Although an Italian sponge is probably the most complicated to make, this recipe is foolproof! The most critical part is that your eggs are warm and you follow the directions, precisely, whipping the eggs together with the sugar, in a mixer (a stand mixer preferably) until the volume expands dramatically. If you’re curious about the different types of cakes and how they compare, you can Read more HERE or HERE! I would recommend using a stand mixer for the beating involved in this type of cake. If you don’t already have one, it’s worth the investment. This is a purchase you will make good use of for a very long time! I recently made this Italian (Genoise) chocolate sponge cake for my husband’s birthday and paired it with a quick chocolate mousse and a quick stabilized whipped cream icing, then I added loads of berries (blackberries, raspberries, strawberries and blueberries). It was AMAZING! 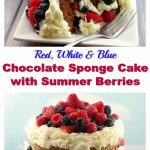 So, if you are looking for birthday cake recipes for adults or homemade birthday cake ideas, this is the one. My family went crazy for it! Reflecting back, buying myself cakes probably wasn’t the best reward strategy for someone who just quit smoking and was worried about gaining weight. So, when I did start to gain weight, which is typical for someone who quits smoking, I had to reign in the celebratory cake purchases. Then down the road, once the weight was under control and I started making my own cakes, I never went back to buying them. You just can’t beat a homemade cake. And this Chocolate Italian Sponge cake is one of the best homemade cakes you will ever eat! 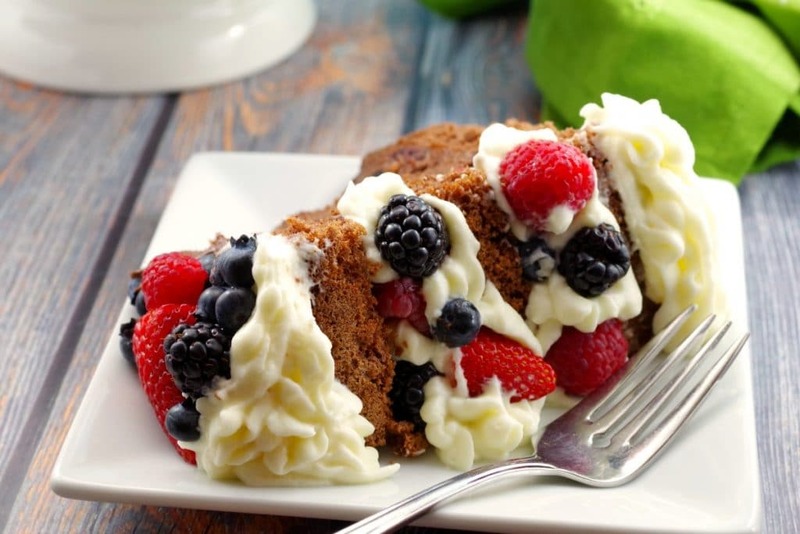 This light and airy Italian (Genoise) Chocolate Sponge Cake is light and airy and filled with a quick, easy and delicious chocolate mousse, loads of summer fruit like raspberries, strawberries, blackberries and blueberries, with a scrumptious stabilized whipped cream icing. This is the perfect adult birthday cake idea! Even before you turn on the oven,, make sure your eggs are out of the fridge - they need to come to room temperature. *this is critical for success with this cake! If you need to warm them quickly, then pour some boiling water into a shallow bowl, then crack your eggs into another bowl and set it on top of the bowl of boiling water. Just keep checking to see if the eggs have warmed. I did this and it worked well. Sift the flour and cocoa together in a bowl. Set aside. In another bowl and using an electric mixer, beat the eggs, sugar and vanilla for about 10 minutes. You'll know when it's done because the mixture will turn pale and quadruple in volume. Then gently fold in the melted butter. Gently pour the flour mixture into the egg mixture, folding it in with a spatula. Pour the batter into the cake pans. * Always fill pans to 2/3 full and no more. Bake until a cake tester or toothpick inserted comes out clean, about 25 minutes. * you will probably have some leftover batter so make a few cupcakes! Let cool for about 10 minutes. Gently run a spatula around the edges of the pans to loosen the cake. Gently turn onto a cooling rack and let cool. * If you use Wilton cake release, your cakes will come out perfect! Dissolve the cocoa powder in the hot water. In a double-boiler (or in the microwave) melt the chocolate chips on 50% power for 2 mins and 30 seconds in the microwave, then stir then for another 30 seconds just until smooth. Add cocoa mixture to the melted chocolate chips and stir well to combine. In a separate bowl, beat the heavy cream and sugar until stiff peaks form. Add the whipped cream mixture to the melted chocolate and fold in with a spatula until well combined. Refrigerate until ready to use. Combine whipping cream and sugar in large bowl. Beat with electric mixer until soft peaks form. Add piping gel and vanilla, then continue to whip until stiff peaks form. Do not overbeat. 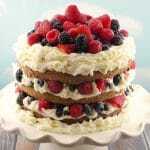 Spread 1/3 of the chocolate mousse on the first layer of cake, then add about 1/4 of the berries. Pipe some whipped cream around the edges of the layer, prior to putting the next layer on top. Repeat for 2nd layer, then for the top. 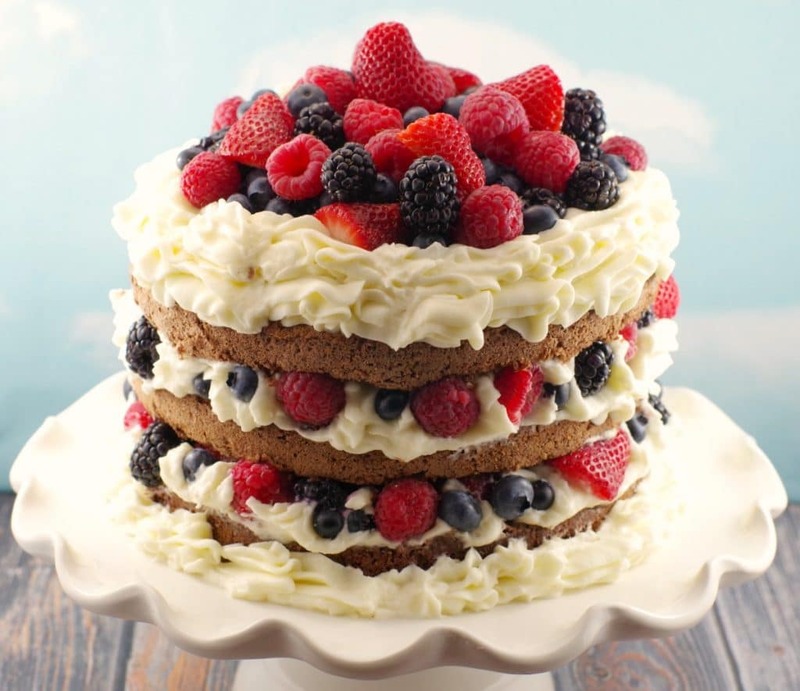 Pile the remaining berries on top of the cake! Pipe whipped cream around the edge of the top of the cake, the bottom and each layer, if it looks like it needs it. Stud whipped cream (between layers( with additional berries, as in my photos, if desired. ***I multiplied the original cake recipe by 1.5. If you want a smaller cake, cut the recipe, but you'll have a lot of leftover mousse and whipped cream icing. This looks so good! I’ve never had it before but really want to now! Thanks, Colleen! If you try it, I can assure you that you won’t be disappointed! Spending $ on summer vacations is the best, Edith! I would spend the $500.00 to pay for a ticket for myself and for my husband to go to the Food Bloggers of Canada Road Tour event in September in Banff/Canmore! If I were to win the $500 I would use to for decor/Renos to the house we are getting this summer! Thanks, Vanessa! That sounds like a fun use of $500. Congrats on the new house!!! That’s right, Ingrid! Berries make it healthy :). But seriously, genoise sponge is one of the healthiest, as far as cake goes, but it’s all the filling (mousse and whipped cream icing) that kind of blows it. Oh well- we only live one, right?! Wow this looks like such a perfect summer cake! Also, feel your pain on the name spelling…I have been called Gabi, Gabbey, Gabbi, you name it! Thanks, Gabby! Yes, it’s especially bad when someone close to you spells your name wrong! 🙁 Now there’s another Teri at work (on my team) and I have to say, “I’m Terri with 2 ‘r”s” ugh! And we still get each other’s emails all the time! This cake looks amazing! I would use the $500 to visit my parents this summer. They just became grandparents and I’m visiting with my son regardless, but it would make flying with an infant much easier, haha! Thanks, Jessica! How wonderful that your parents get to meet your little guy – what a great way to spend the $! Good luck in the giveaway! Hi Jolina- thanks! Yes, I agree – I’ll use any reason to eat cake! The mounds of berries make it feel a little healthier 🙂 and sort of compensated for the whipped cream and mousse! Good luck in the giveaway! Congrats on quitting smoking!! I’m at almost thirteen years ago now that I quit and still celebrate. 🙂 I’m jealous of the nickname. Sharon doesn’t really spawn any and I always wanted one. I want this cake too! Looks delish. Thanks, Sharon! And congrats to you for staying smoke-free too! Funny… I always loved the name Sharon and as a kid, I remember wishing it was my name! I would replace my food processor – it’s almost 20 years old and has taken a beating over the years. You could get yourself a pretty amazing food processor, Karen! Good luck in the giveaway! Yes, it was a rough winter, Amanda! I feel your pain with the high bills… Good luck in the giveaway! I happen to love the name, Terri. It was my Moms nickname too (for Theresa). I adore making this type of cake – it is my favourite cake to make, actually. Sponge cakes are so lovely to work with. If I won this prize, I would buy my niece a KitchenAid for her wedding gift. She loves to bake and often asks me for tips. Thanks for this opportunity and your great cake recipes. Thanks, Denise! I do like Terri, but not Teresa. Because I never felt like it was MY name. It’s neat to hear someone else named Teresa that used Terri for short! Most Terri’s I know, aren’t Teresa’s. That sounds like an amazing wedding gift! I got one for my wedding and was thrilled beyond belief at the generosity! This looks crazy delicious!! I’m all about cake lol. I would use the money for a lovely summer family get together/ reunion! Thanks, Jo! Sounds like a great way to use the $ – good luck!!! I would spend the $500 on a weekend road trip with the family. Thanks, Jonni – I will note that! If I win the giveaway cash I would be spending it towards some new kitchen counter tops for my kitchen. This would be a big help for me as they need to be changed. Your chocolate Italian sponge cake looks totally sublime! It would be such a decadent treat. Thank you for the wonderful giveaway! Looks and sounds super fancy- and delish! Thanks, Anna! That sounds like a great way to spend some extra cash! 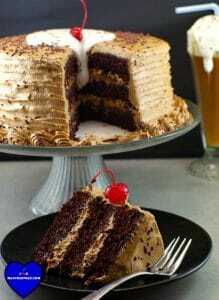 I love this cake, looks delicious! I would put the money towards our summer holiday to our family reunion in Saskatchewan. Thanks, Sheena-sounds like a wonderful way to spend the money! Good luck!!! Hi Sivakame. Thank you -I am glad you are loving the recipes! That would be so wonderful for you to get away on your honeymoon. Good luck in the giveaway!